Fourteen survivors of a ferry sinking in Indonesia have been rescued from the sea nine days after their boat sank in a storm off Java, officials have said. They were picked up in a life raft by a passing cargo ship 500km (310 miles) from where their ferry sank. 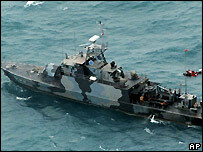 A fifteenth person died soon after the group was rescued near Bali. The Senopati Nusantara car ferry was carrying more than 600 people from Borneo to Java when it sank. Poor weather hampered rescue efforts. The 14 survivors have been taken to Makassar on the island of Sulawesi where port officials said they were very weak and dehydrated. They survived by drinking rainwater and eating food supplies stored on the life raft, rescue officials said. The BBC's Lucy Williamson, in Jakarta, says the news of the survivors has refocused attention on the rescue effort. The search has been extended to the waters around the island of Bali, as stormy weather and currents have carried survivors hundreds of kilometres to the east of where the ferry went down. About 235 survivors have been rescued so far, found on life rafts, small islands and oil rigs in the Java Sea. A simultaneous search for a missing Boeing 737 passenger jet has revealed large metal objects on the seabed off the west coast of Sulawesi. The plane disappeared from radars a week ago carrying 102 people. Transport officials investigating the ferry disaster have been blaming the rough weather for the sinking. One said last week she suspected that high waves had entered the ferry's car deck over the door, making the vessel unstable, the Associated Press news agency said. Very few bodies have so far been found. A navy spokesman said hundreds of bodies were probably trapped on the lower decks of the ferry, AP reported.